1Unidad de Tecnología Ambiental, Centro de Investigación y Asistencia en Tecnología y Diseño del Estado de Jalisco A.C. (CIATEJ), Guadalajara, Jalisco, México, CP 44270. *Corresponding autor: smcontreras@ciatej.mx; smcontrerasr@gmail.com 2Laboratorio de Ecología de Suelos, ABACUS, Centro de Investigación y de Estudios Avanzados del Instituto Politécnico Nacional (CINVESTAV),Ciudad de México, México. 3Unidad de Biotecnologia Médica y Farmacéutica, Centro de Investigación y Asistencia en Tecnología y Diseño del Estado de Jalisco A.C. (CIATEJ), Guadalajara, Jalisco, México, CP 44270. 4Centro de Investigaciones en Ciencias Biológicas, Laboratorio de Micorrízas, Universidad Autónoma de Tlaxcala, km 10.5 Autopista Tlaxcala-Texmelucan, San Felipe Ixtacuixtla, Tlaxcala, México, CP 90120. Irrigation of arable soil with wastewater is a common practice. It provides water to the growing crops and increases the soil organic matter content, plant nutrients, and microbial population. However, application of wastewater might reduce soil aeration and increase soil salinity, with an adverse effect on soil properties and fertility. Also, organic amendments applied to the soil can change the composition of the microbial community (Zaccardelli et al., 2013). Despite this, the application of wastewater such as vinasses to arable soil is a widespread practice in many countries (Moran-Salazar et al., 2016). Vinasses are a residual liquid generated during ethanol production from sugarcane (Saccharum officinarum L.), sugar beet (Beta vulgaris ssp. ), or from the distillation of spirits, such as mezcal, tequila, and others. The characteristics of vinasses depend mainly on the raw material used, but all of them share similar properties, such as a low pH (3.9 to 5.1), a high chemical oxygen demand (COD) (50,000 to 95,000 mg L-1) and biological oxygen demand (BOD) content (18,900 to 78,300 mg L-1) (Arimiet al., 2014; Moran-Salazar et al., 2016). They have a high concentration of suspendedand dissolved solids, and large amounts of K+, Ca2+, and Mg2+ ions. The average proportion of vinasses generated duringalcohol production (sugarcane and sugar beet) and distilled beverages (tequila or mezcal) ranges between 7 and 15 L by liter of final product (Moran-Salazar et al., 2016). Vinasses share some characteristics and present many of the same issues for treatment, management and final disposal (Arimi et al., 2014). Regularly, they are used without previous treatment as an organic amendment or fertilizer for arable soil. Potential negative effects of vinasse on soil (e.g. acidification, increase in cations content and metals), water (contamination of rivers, lagoons and aquifers by nitrates or metals), air (increase of greenhouse gases emissions), microorganisms (decrease of biomass) and plants, have been reported when they are applied at high rates (Moran-Salazar et al., 2016). Little is known about how the vinasses affect arbuscular mycorrhizal fungi (AMF) population and diversity. The addition of sugarcane vinasses decreased the glomalin content of AMF (Velásquez Pomar and Sánchez de Prager, 2011). Meanwhile, Pereira Aleixo et al. (2014) reported no significant differences in AMF spore density between sugarcane crop with and without irrigation with alcohol vinasses.Montenegro-Gomez (2008) found an inhibition of AMF colonization in maize plants irrigated with sugarcane vinasses. Thus, the aim of this research was to determine the presence and diversity of AMF in an unamended agricultural soil compared to a similar soil regularly amended with vinasses to elucidate how vinasses irrigation could change the AMF populations in the soil. The experimental site was located in El Arenal, Jalisco, Mexico (20° 46' 7" N and 103° 41' 18" W) at 1450 m a.s.l. The weather is dry with an average annual temperature of 20 °C and 1104 mm precipitation. The soil has been used for sugarcane cultivation (Saccharum officinarum L.)for 30 years. The soil was collected in the last stage of sugarcane growth just before the plant was cut for sugar production. The experimental site has two different areas: 1) a field (2.4 ha) irrigated with tequila vinasses at 83 m3 ha-1 month-1 (considered the VS treatment) during 8 months each year, for at least 5 years, and 2) a field (1.8 ha) not applied with vinasses and considered the control soil (CS treatment). Each experimental area was divided into three plots to obtain three independent samples (n = 3). Twenty sub-samples were taken at random from each of plots (n = 6). The samples of each plot were pooled so that for each treatment three separate samples were obtained. The soil sampling procedure is given in Figure 1. The soil was transferred to the laboratory, sieved separately (5 mm mesh), and stored for characterization and AMF spore extraction. Additionally, samples of vinasses were collected immediately after distillation from a tequila factory that process agave traditionally. The vinasse from this factory has been used to irrigate the sampling site. The vinasse was then analyzed for physicochemical parameters. Figure 1. Scheme representation of sampling and management of replicates. (VSS), settleable solids (SS), total and available P and total N (APHA, 1992).Vinasse applied to this field always came from the same distillery where the same cooking process has been followed since the beginning. It can thus be assumed that the composition of the vinasse was similar over the years. The AMF spores were isolated three times from each plot of CS and VS soils (n = 9), using a wet sieving method with sucrose at 50% (w/v) and four sieves with 600, 150, 75 and 45 µm mesh (Brundrett et al., 1996). Sieved spores were sorted by morphotypesunder a stereomicroscope (NIKON SMZ745T, Beijing, China) and pooled. Slides were prepared with polyvinyl alcohol (PVLG) or Melzer reagent-PVLG (1:1, v/v). 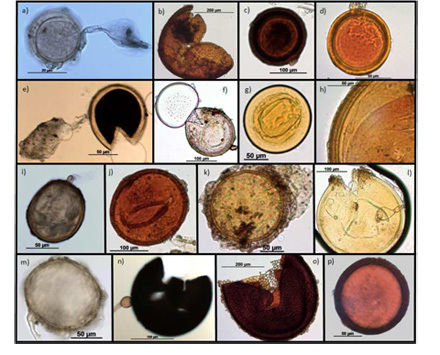 Taxonomic identification was carried out using an optical microscope with Nomarski interference contrast (AxioLab, A1 Carl Zeiss, Jena, Germany) and compared with descriptions from the international culture collection of vesicular arbuscular mycorrhizal fungi (INVAM, 2017) (http://invam.wvu.edu/). Spores were photographed with a digital camera (Axio Cam ERc 5s, Jena, Germany) by AxionVision® SE64, Release 4.9 software. The relative abundance (RA) of spores and number of species (richness S) was determined. Shannon-Wiener index (H'), Pielou,s evenness index (J,) and the Simpson index (expressed as 1-D) were calculated to determine species diversity (Magurran, 2004). The AMF root colonization was determined based on the methods of Ishii and Loynachan (2004) which consisted in clearing the roots with KOH (10% w/v) at 90 °C for 90 min followed by staining with Trypan blue (0.05% w/v) in lactoglycerol:water (lactic acid-glycerol-water 1:1:1 v:v:v) at 90 °C for 30 min.The presence of mycorrhizal structures (hyphae, arbuscules, vesicles or coils) in one field of view were used for confirmation of root colonization. Average from several fields were examined using the previously described optical microscope at a 40´magnification. Spore abundance data were analyzed through a U-Mann-Whitney test to compare medians. Richness, diversity indices, root colonization and physicochemical parameters of soil were compared through a Student’s test. Relative abundance (RA) data were log (x +1) transformed and subjected to a two-way variance analysis (ANOVA) to determine differences the two soils and the species. Centurion Statgraphics XVI.I. (Statpoint Technologies, Virginia, US) software was used to analyze the data. The sandy loam CS and VS soils were classified as phaeozem characterized by a high organic matter (9.4% in CS and 7.4% in VS) and nutrient content (nitrogen and phosphorus). The pH was neutral or near neutral (6.5 in CS and 7.0 in VS), the electrical conductivity was similar with 83.8 and 80.4 µS cm-1 in CS and VS respectively, and the cation exchange capacity was 27 and 25 Cmol kg-1 respectively. 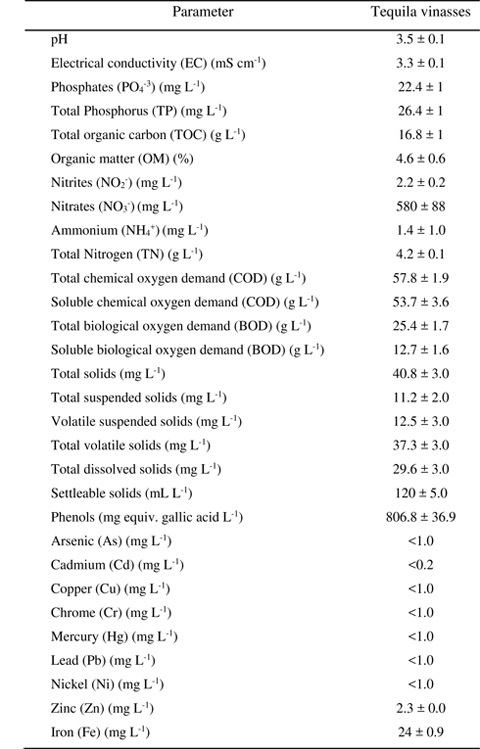 Additionally, heavy metals concentration was low (Table 1). Table 1. Control and vinasses irrigated soil characterization. The vinasse was characterized by an acid pH, a low EC, total P content, total N content, COT, BOD, settleable solids and total volatile solids (Table 2). Table 2. Physicochemical characterization from tequila vinasses. In this study, sixteen AMF species were found in the CS and VS soil. Most species found were from the genus Acaulospora. They were identified as: Acaulospora delicata, A. sp, A. foveata, A. laevis, A. mellea, A. morrowiae, A. scrobiculata, A. spinosa, Claroideoglomus etunicatum, Funneliformis geosporum, F. mosseae, G. margarita, Paraglomus occultum, Racocetra gregaria, Scuttelospora reticulata and Septoglomus constrictum (Figure 2). AMF such as C. etunicatum, F. constrictum, and R. gregaria were found in VS soil, but not in CS soil. Acaulospora morrowiae, Acaulospora sp. and S. reticulate were found in the CS soil, but not in VS soil. Figure 2. AMF isolated and identified in CS and VS soil. a) Acaulospora delicata (10x objective); b) A. foveata (10x); c) A. laevis (10x); d) A. mellea (40x); e) A. morrowiae (10x); f) A. scrobiculata (10x); g) A. sp. (10x); h) A. spinosa (40x); i) Claroideoglomus etunicatum (10x); j) Funneliformis geosporum (10x); k) F. mosseae (10x); l) G. margarita (10x); m) Paraglomus occultum (10x); n) Racocetra gregaria (10x); o) Scuttelospora reticulata (10x) and p) Septoglomus constrictum (10x). The abundance of AMF spores in the CS (248 ± 37 spores per 100 g soil) and VS soil (209 ± 12 spores per 100 g soil) did not show a significant difference between soils (P = 0.1528) (Figure 3). 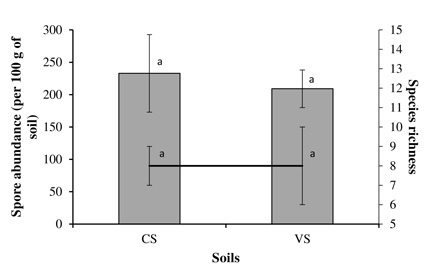 Likewise, the CS and VS soil had similar AMF species richness (S) and no statistically significant differences were found between CS and VS in this parameter (P = 0.8797) (Figure 3). Root fragments collected in both soils showed AMF colonization. There was no significant difference (P>0.05) between CS (45.0% ± 8.7%) and VS (60.0% ±6.0%) in root colonization percentage (Figure 4). Figure 3. Spore abundance (bars) and species richness (line) of arbuscular mycorrhizal fungi in control (CS) and vinasses irrigated (VS) soil. Bars with the same letter were not significantly different (P > 0.05) (n = 9). Figure 4. Root colonization (%) of AMF present in CS and VS soils. Bars with the same letter were not significantly different (P > 0.05) (n = 9). In the CS soil, Acaulospora mellea (27%) and F. mosseae (25%) presented a significantly greater relative abundance (RA) than the other species (P < 0.05), followed by A. scrobiculata (18%), Paraglomus occultum (14%), Funneliformis geosporum (7%) and Gigaspora margarita (4%) (Table 3). In the VS soil, the species that presented a significantly greater RA (P < 0.05) than the other species were F. mosseae (32%) and A. mellea (27%) followed by A. scrobiculata (13%), F. geosporum (10%), P. occultum (4%) and Gigaspora margarita (5%) (Figure 5). 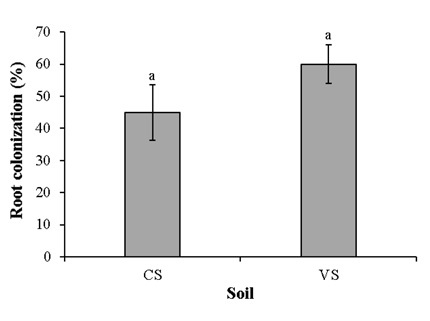 The relative abundance of AMF was not significantly different between the CS and VS soil (F = 0.29, P = 0.2733). Table 3. Diversity indices of AMF species present in CS and VS soils. The AMF Shannon-Wiener index (H,) in the CS soil was 1.98 ± 0.28 and not significantly different from that in the VS soil (1.88 ± 0.40) (P=0.8502), the Simpson index (1-D) was 0.78 in CS and 0.76 in VS (P=0.3748) and the evenness (J,) was 0.83 for CS and 0.82 for VS (P=0.8086). The Simpson index and evenness were not significantly different between soils (Table 3). Figure 5. 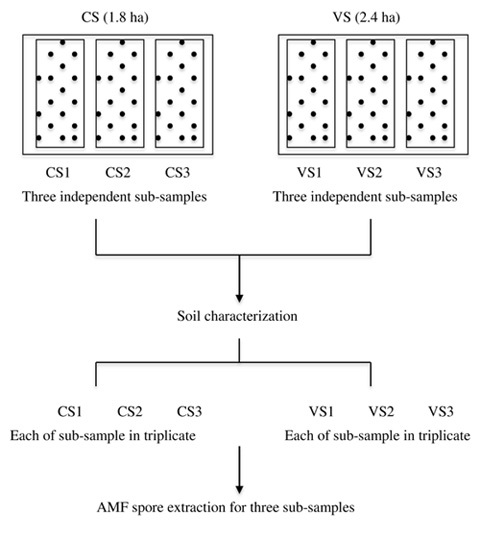 Relative abundance (% of total spores) of AMF present in CS and VS soils. Different lowercase letters indicate significant differences between species and capital letters between soils (P < 0.05) (n = 9). Physicochemical parameters in the soils were classified according to Mexican and American standard regulations (NOM-021-SEMARNAT, 2000; USDA, 2014). The organic matter content was high in the soils as is reported for Phaeozem soils (FAO, 2014). They were non-saline with a high CEC probably because of the high clay content in both soils. A soil with a high organic matter content and CEC as found in CS and VS has been related to a large pH buffering capacity (Xu et al., 2012). This could explain why the application of highly acidic vinasses (as described later) did not acidify the soil.The mineral N content was low although the total N content was medium. This suggested that mineralized N was immobilized immediately. and the amount of heavy metals was low, which did not exceed Mexican and American standards regulations (NOM-021-SEMARNAT, 2000; USDA, 2014). It has been reported that soils cultivated with sugarcane crop have an organic matter high content (59 g kg-1 to 6.9 g kg-1) and high total nitrogen content (1.8 g kg-1 to 2.4 g kg-1)(Mthimkhulu et al., 2016), which are concordant with values and the classification found in this study. Also a phaeozem soil is characterized by a pH ranging from 5 to 7 (FAO, 2014)and the pH of sugarcane soils is reported on a wide range from 4.5 to 6.0 depending on fertilizer application rates and soil type(Azevedo et al., 2014; Mthimkhulu et al., 2016). The USEPA (2004)regulations do not establish maximum limits for EC, BOD, COD or nitrates for wastewater discharge on agricultural soils, only for pH (9), total BOD (4.5 g L-1) and TSS (45 mg L-1). In Brazil, irrigating soil with sugarcane vinasses is permitted by standard regulation (CETESB, 2006). 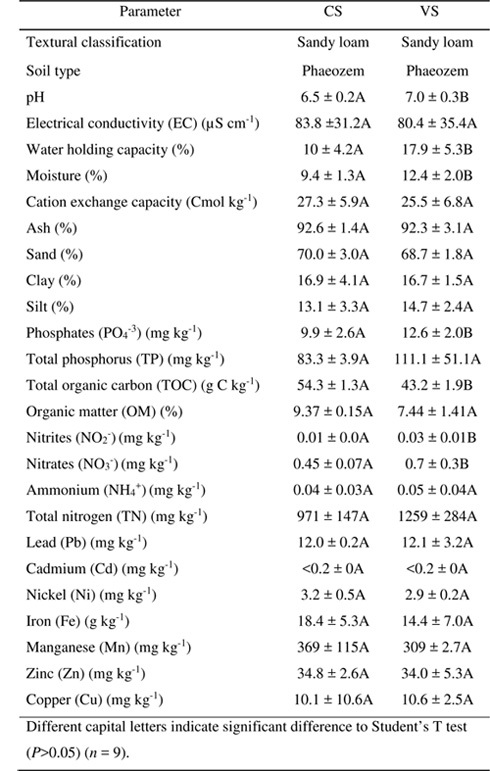 Only limits for the amount of K2O that can be applied to soil are given (185 kg K2O ha year-1), but not for other parameters, such as BOD, COD, and N or P. The heavy metal content in vinasses was below limits established by standard regulation for the discharge of wastewater in agricultural soils (USEPA, 2004). Some of the genus found in CS and VS soil have been reported in soil from sugarcane crops in Brazil without vinasses irrigation such as Acaulospora, Glomus, Funneliformis, Paraglomus, Gigaspora, Scutellospora, and Racocetra (Azevedo et al., 2014). This could suggest certain preference of AMF by sugarcane plants regardless of environment conditions and resistance of AMF species to vinasses irrigation found in this study. The genera Claroideoglomus and Funneliformis (present in VS soil) are normally described as generalists species (Castillo et al., 2016)because they are found in a wide range of ecosystems, which is probably why they resisted the disturbance caused by vinasses. Other species, which are considered specialists, are only found in specific conditions, and they could probably not resist the change in pH or the high amount of phenolic compounds as a result of vinasse application. The abundance of AMF in both soils fell into the interval reported by Datta and Kulkarni (2012)(135-395 spores per 100 g soil) in a sugarcane soil without vinasses irrigation. However, in sugarcane crops with different management systems (burning and unburning) the AMF spore abundance was reported from 31 to 40 spores per 50 g of soil (Azevedo et al., 2014). These values were lower than found in this research in sugarcane soils irrigated with vinasses. The colonization percentage agreed with that reported by Azevedo et al. (2014) for AMF colonization in sugarcane roots (31-36%) in perturbed (burning) and not perturbed soil (not burned) (49-51%). On the other hand, the tequila vinasse had high phenolic compounds content (806.8 ± 36.9 mg L-1) (Table 2). This was higher than reported by Ferral-Pérez et al. (2016) in tequila vinasses (44-81 mg L-1) and (603 mg L-1), or sugarcane (34 mg L-1), beet (450 mg L-1) and mezcal (478-542 mg L-1) vinasses (Moran-Salazar et al., 2016). Some phenolic compounds reported for sugarcane vinasses are protocatechuic acid, p-hydroxybenzoic acid, chlorogenic acid, vanillic acid, caffeic acid, benzoic acid, vanillin, p-coumaric acid, ferulic acid and syringic acid (Arimi et al., 2014), the last three are also reported for sugar beet vinasses (Bostyn et al., 2009), whereas for tequila vinasses there are no reports about the specific phenolic compounds. Johnson et al. (1992) reported that phenolic compounds could reduce the AMF colonization, other reports showed that it depends on the concentration and kind of phenolic compounds, which could affect positive or negatively to AMF (Becard et al., 1992), i.e. ferulic acid (>50 mg L-1) inhibited AMF colonization (Wacker et al., 1990); hesperetin, apigenin, chrysin and biochanin-A in >10 mM concentration (» 0.302, 0.270, 0.254, 0.284 mg L-1 respectively) presented hyphal growth inhibition in AMF spores in vitro (Becard et al., 1992). Compounds such as p-coumaric acid, p-hydroxybenzoic acid, or quercetinat > 1 mM (» 164, 138 and 302, mg L-1 respectively) were inhibitory for growth and AMF colonization in clover and sorghum plants (Fries et al., 1997). Piotrowsky et al. (2008)reported decrease in AMF colonization in roots from Sorghum sudanese plants with coumarin, feluric, caffeic and vanillic acid at 250 mg kg-1 soil. However, other phenolic compounds such as quercetin, myricetin and kaempferol stimulated spore germination and hyphal growth in vitro conditions at 10 mM concentration (Becard et al., 1992). These highlights in the literature suggest that phenolic compounds could be one of constituents from vinasses that could have positive or negative effect on AMF and then influence changes in the AMF populations. However, more information is necessary about AMF association and colonization of plants, populations and diversity, with different sources and rate applications of vinasses to improve our understanding on changes induced by vinasses irrigation in agricultural systems. Few studies have reported on AMF in soil irrigated with vinasses. So, to our knowledge, this is one of the first description of AMF species in soil frequently irrigated with vinasse. Among the species reported by Azevedo et al. (2014) as the most frequent species (> 50%) in soil from sugarcane crops without vinasses irrigation, Acaulospora scrobiculata coincides with the present work, while other species are different (A. morrowiae, Glomus macrocarpum, and Scutellospora pellucida) to found in our study. Diversity indices showed that although there were no significant differences, H, is higher in CS soil than in the disturbed soil from VS, which has been reported previously. Azevedo et al. (2014) reported a similar H’ for AMF (1.50 ± 0.28) in unburned and burned soils (1.57 ± 0.22) cultivated with sugarcane. Marín et al. (2016) however, reported a significantly higher H, (2.24), (1-D) (0.88) and J, (0.89) (P<0.05) for AMF in forests soil compared to disturbed forests (H, = 1.586, (1-D) = 0.747 and J,= 0.815). The high 1-D and J, value found in this study indicate that there was no dominant species and the species were distributed more or less uniformly. This could mean that all species in the AMF consortium were equally adapted to vinasse application, since all of them have been subjected by years of the same abiotic stress induced by the application of vinasses. The pH of the soil is other factor that could determine the distribution or amountof AMF and regulates their life cycle, i.e. G. margarita is found in soil with pH < 5.5 and A. scrobiculata, A. spinosa and G. etunicatum are found in tropical soils with pH 3.8-8.0 and Funneliformis is common in neutral and slightly alkaline soils (Mukerji et al., 2002), while Acaulospora genus has been reported in acid soils (Abbott and Robson, 1991), or Glomus genus with highest spore abundances in sugarcane soil (pH 5.9) followed by Scutellospora and Aculospora species (Azevedo et al., 2014). In this work, the predominant genus was Acaulospora although the soils were neutral (VS) and lightly acid (pH 6.5) for CS. Although the vinasse has a very acid pH, after application to soil, it was not acidic. This indicated a buffer effect of soil due to the organic matter decomposition, which contributed the buffer effect in soils (Quiroz and Rojas, 2009). So, the AMF species associated to soil could have an acid-neutral interval of pH in this habitat induced by vinasses irrigation. Sixteen AMF were found in two agricultural soils: irrigated with vinasses or left unirrigated. This irrigation is not detrimental to arbuscular mycorrhizal fungi. The predominant arbuscular mycorrhizal fungi were Funneliformis mosseae and Acaulospora mellea. No significant differences were found in the abundance, colonization, richness, and diversity of arbuscular mycorrhizal fungi as a result of vinasses irrigation. The species found were more or less evenly distributed and there was no increase in dominance in vinasse amended soil, which could mean that the AMF consortium was adapted to the application of vinasses and not only a single species. However, although no significant differences were found in the abundance, colonization, richness and diversity of the arbuscular mycorrhizal fungi, their metabolic activity might have been altered which might affect their beneficial effect on crop growth. Further studies are thus required to investigate possible changes in the metabolic activity of the arbuscular mycorrhizal fungi. The authors want to dedicate this manuscript to the memory of G. Davila-Vazquez (R.I.P.) friend, co-author and co-worker in this research and other derived from it, for his contribution, dedication and enthusiasm at all times. This research was funded by CONACYT Mexico through project 181070 from "Fondo Sectorial de Investigación para la Educación SEP". The authors are indebted to Tina Kim Coop (Peace Corps Mexico) for proof-reading the manuscript. INVAM, 2017. International Culture colletion of (Vesicular) Arbuscular Micorrhizal Fungi. Date: January 2017. https://invam.wvu.edu. Montenegro-Gomez, S.P. 2008. Influencia de la aplicación de vinaza sobre la presencia, actividad y biomasa microbiana del suelo en el cultivo de maíz dulce (Zea mays), Tesis de Maestría, Facultad de Ciencia agrarias, Universidad Nacional de Colombia. NOM-021-SEMARNAT. 2000. Especificaciones de fertilidad, salinidad y clasificación de suelos, estudio, muestreo y análisis. Secretaría de Medio Ambiente y Recursos Naturales (SEMARNAT), Diario Oficial, [ Links ] p.